A new report has labelled £150m plans to reopen a railway line between Oxford and Milton Keynes as part of an eco-town as "woefully under funded". Developer Parkridge has promised delivery of the East-West rail link as part of its scheme for 15,000 homes at Weston Otmoor, near Bicester. It is one of 15 potential new eco-towns on a government shortlist. 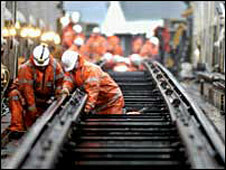 But the East West Rail Consortium, which is promoting the railway line, said it would cost at least £190m. The consortium was formed in 1995 by Ipswich Borough Council and includes local authorities, railway companies and local businesses. It has carried out extensive feasibility work on costs and timetabling for the line. It concluded that the line, which already has support from Network Rail and train operators, still requires more funding. The consortium said it would cost at least £190m to run two trains an hour between Oxford and Milton Keynes, and £228m if trains linked to the Chiltern line at Aylesbury. Report author Adrian Saunders, Oxfordshire County Council's representative on the rail consortium, said: "Parkridge have stated an intention to implement East West Rail at their own cost between Oxford and Milton Keynes, and they have set aside £150m. "This amount does seem woefully inadequate." Parkridge has promised to add more stations and run more trains, as well as tram-trains that would use the same track between Weston Otmoor and Oxford. But the report to Cherwell District Council said these promises would require an extra track between Bletchley and Milton Keynes to leave existing tracks clear for West Coast Main Line trains. That would mean buying land and expanding bridges. A similar idea was dropped by the East West Rail Consortium in 2006 because it was expected to cost an extra £73m. The report also casts doubt on promises by Parkridge to run free eco-friendly tram-trains to various points in Oxford, including city hospitals, and double-decker trains. "Double-deck trains are typically about three feet taller than normal trains. Even the slightest increase in train height would add millions of pounds to the cost (in) modifying bridges and tunnels or lowering the track level," the report said. The report is based on confidential documents supplied to the county council by the developer. 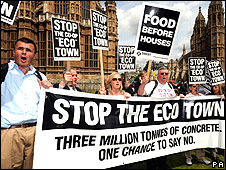 Both the county council and Cherwell council have opposed the eco-town proposal. No one from Parkridge was available for comment.